The US military has delivered more than 45 tonnes of ammunition to rebels fighting the jihadist group Islamic State (IS) in north-eastern Syria. C-17 transport aircraft, accompanied by fighter escorts, dropped pallets of supplies overnight in Hassakeh province, a Pentagon spokesman said. The consignment reportedly comprised small arms, ammunition and grenades. It comes days after the US abandoned a $500m (£326m) plan to train thousands of "moderate" rebels to fight IS. The money will instead be used to provide much-needed ammunition and some weapons to commanders of rebel groups already established on the ground. The Pentagon said the more than 100 pallets dropped in Hassakeh were collected safely. They were intended for Syrian Arab groups whose leaders have been vetted and who enjoy the confidence of the US-led coalition battling IS, it added. This is indicative of the type of activity the US is likely to step up in the wake of the failure of its larger scheme to recruit train and equip a new opposition army. The stress now is on vetting the leaders of opposition militias rather than each and every member. Small arms and ammunition may be important in terms of keeping a specific group in the fight, but it is heavier weaponry - like the supply of US-made TOW anti-tank missiles to other groups - that has made the most impact on the battlefield. A spokesman for one of the groups, the Raqqa Revolutionaries Front, told the Reuters news agency that they had been told that the supplies were to help them launch a joint offensive on the city of Raqqa - an IS stronghold - with the YPG militia. The Raqqa Revolutionaries Front and the YPG are part of an alliance of Arab and Kurdish groups, called the Democratic Forces of Syria, whose creation was announced on Monday. In a statement sent to Reuters news agency, the YPG said "rapid developments on the military and political front" require "a united national military force for all Syrians, joining Kurds, Arabs, Syriacs and other groups". YPG fighters, backed by Arab rebels and US-led coalition air strikes, have driven IS from large parts of northern Syria in the past year and now control much of Hassakeh. The Syrian government also has a presence in the provincial capital. Meanwhile in north-western Syria, Russian jets reportedly intensified their attacks on rebel positions on the Sahl al-Ghab plain, as government forces battled to regain control of the strategic area. 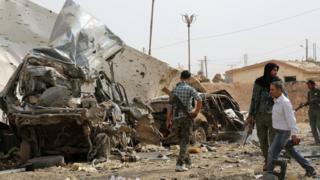 Fighting was focused on the village of Kafr Nabudeh, in Hama province, activists and officials said. Capturing the area would cut off a key motorway and give government forces access to Idlib province, most of which is controlled by a rebel alliance. The Russian defence ministry said it had bombed 53 Islamic State targets in the provinces of Hama, Homs, Latakia and Idlib over the past 24 hours. However, the jihadist group is believed to have only a limited presence in Hama. The UN envoy for Syria, Staffan de Mistura, said he hoped Russia and the US would agree to form the core of one or more "contact groups" of countries supporting talks on a political solution to the Syrian conflict. Russian Foreign Minister Sergei Lavrov said he was "interested in establishing a coalition" between the US-led forces targeting IS from the air and the Russian military. Mr Lavrov said he had asked "those who claim to know the situation on the ground better" to provide Russian forces with the location of IS militants but said they "have yet to reply". He also said Russia was prepared to co-operate with Syria's "so-called patriotic opposition". More than 250,000 people have been killed since the uprising against President Bashar al-Assad erupted in 2011. Some 11.5 million others - more than half of the country's population - have fled their homes. Anti-government protests developed into a civil war that four years on has reached a stalemate, with President Bashar al-Assad's government, Islamic State, an array of Syrian rebels and Kurdish fighters all holding territory. Iran, Russia and Lebanon's Hezbollah movement are propping up the Alawite-led Assad government, while Turkey, Saudi Arabia and Qatar back the more moderate Sunni-dominated opposition, along with the US, UK and France. Hezbollah and Iran have forces on the ground, while a Western-led coalition and Russia are carrying out air strikes.